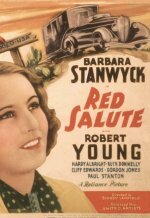 General's daughter Barbara Stanwyck falls for a Communist and her father sends her to Mexico, where she meets a young soldier. Ensuing complications have them both on the run. Made when the radical movement in American universities was strong, this is basically a road comedy heavily reminiscent of It Happened One Night, with the spoiled daughter, in this case, having to see the error of her leftist enthusiasms. At its premiere, 150 students picketed and critics either condemned it as propaganda or felt it burlesqued "the American Way". The framing sequences remain unconvincing but, discounting the politics, it's diverting enough, with a particularly good-natured and disarming performance by Stanwyck.